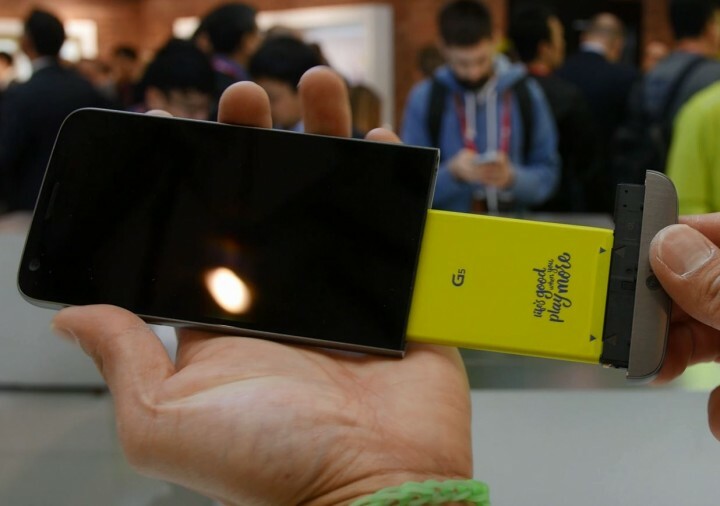 LG has launched their latest flagship smartphone, the LG G5. This is their 5th iteration of G series smartphones and with their latest version, LG has transformed its phone into a modular with all metal unibody design. The LG G5 comes with a 5.3-inch quad-HD 1440P display, Snapdragon 820 processor, 4 gigs of RAM, 32GB of internal storage, and a micro-SD card slot for expanding storage. There’s also an always-on LCD, that has its own separate power. For battery, the LG G5 uses a modular slide-out battery that can easily be swapped for new batteries on the go. This is the world’s first smartphone to feature all unibody design along with a removable battery. For those of you concerned with battery life yet you want an all metal unibody design, this may be the way to go. On the top of G5, you will find a 3.5mm headphone jack followed by IR blaster and microphone. On the left are the volume buttons, on the right is the microSD and nanoSIM slot. The G5 has an interesting design as there’s a slot on the middle of the device which is wide enough to slide your fingernails across it. On the bottom of the device, you will find speakers and a USB Type C.
On the back, he LG G5 comes with whopping two cameras on the back, one with 16MP F1.8 for great low-light performance and bokeh while the 8MP F2.4 can capture a super-wide angle of 135 degrees along with fingerprint sensor and power button. I am actually amazed at this as it’s like having two cameras in one smartphone, wait it has two cameras. This makes the G5 more versatile than many other smartphones out there and the wide-angle is wider than the Galaxy Note 5 and LG V10. Also, the wide-angle camera will help you stabilize your video recordings better. For manual mode, the LG G5 has full shutter speed control, ISO, and white balance but did not include manual mode for video recording. The front camera is an 8MP camera with up to 1080P video recording. There’s also various different film modes, which can get you different film effects, which I thought was really cool to get film grading on the go. Need more battery life and quick camera buttons? You can grab G5’s Cam Plus module that gives you extra 3 buttons, one for video recording, one for stills, and even a dial dedicated to zooming in and out. I found that the zoom feature didn’t work quite as smooth but that may be improved by the time you see the final version. Although it was very loud, I was able to hear the music coming out of the LG G5 at the booth. The speakers are really loud considering I was able to hear the music over the crowd. I will have to do further testing later when I get one but it is definitely on the loud side. If you want to listen to high quality audio, you can grab the HiFi Plus DAC module to enjoy high-quality 32-bit sounds. I really like that you have the option to do this so people who don’t need it, they don’t have to spend extra. For battery, you will find a 2800mAh battery. To remove the battery, you must hit the small button then pull out the module. Then you can pull out the battery from the module to replace it with another one. Charging times are quick as the G5 also supports Quick Charge 3.0 with its USB Type C. You can go from 0 to 83% in just 30 minutes and this is one of the first flagship smartphones to support both USB Type C and Quick Charge 3.0. Performance should be excellent on the G5 as it comes with Qualcomm Snapdragon 820 and 4 gigs of RAM. This is definitely the year of Snapdragon and I have witnessed first-hand at CES 2016 earlier how fast the 820 benchmarks are, which is around 130,000 on Antutu. In my testing, I had no lags whatsoever, everything ran damn fast. As for software UI, you get LG’s new UI which has removed the app drawer. I actually like the new launcher and UI as everything is minimalistic with very minimal LG bloatware. Now, you are probably wondering, what do I think? As a person who have owned more Android smartphones than most, I really really really dig the new G5. First, all metal-unibody design is simply right on while also including a micro-SD card slot and removable battery. That alone is a keeper in my opinion. Second, the phone is only 5.3-inches, it’s not phablet by any means and LG has decided to make the phone smaller from its predecessor 5.5-inch G4. I am more of a phablet guy so this probably won’t end up as a daily driver so I wish it was bigger. If you are in the same boat, you may want to wait for the next V11 or V20 from LG. Third, this is also one of the first flagship smartphones that feature modular battery, DAC, and camera handle. I think LG is definitely stepping up the game by innovating and modular definitely makes sense. Overall, I am very impressed with the LG G5 and what LG has done this year. This is definitely something more interesting over the Galaxy S7 I think and if you are torn between the two, I would definitely say the G5 is a winner. Of course, I will have a full review eventually but that’s my first impressions on the G5. Don’t forget to hit the thumbs up for me if you enjoyed this video and as always, stay HIGH on Android! Next story Galaxy S7 & S7 Edge Hands-on Review! Previous story BIG Android Giveaway February!